Dr. Stephen Rasmussen has been a Chiropractor for 36 years, and specializes in auto accidents and spinal decompression. 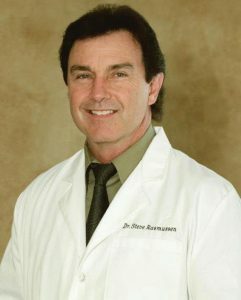 Having treated over 4,000 auto accident cases, Dr. Rasmussen is very involved with his patients, spending much time educating and advising, and enjoys what he does. The sooner treatment is begun following an accident, the better the chances are of a full recovery. Dr. Rasmussen employs a state-of-the-art DRX-9000 de-compression unit used in treating patients with a variety of issues including bulging and herniated discs, degenerative disc disease, sciatica, and even relapse or failed back surgeries. This method has provided relief for the majority of patients who suffer from slipped disc and leg pain (Sciatica). Depending on the severity of the injury, Dr. Rasmussen uses a combination of Chiropractic, physiotherapy, sports massage, and rehabilitative exercise. He begins with a general consultation to determine if the patient falls under the purview of the services he offers, or he can refer to other specialists. If the patient can be benefited from his Chiropractic program, he will perform a physical exam to set up the best course of treatment. If you’re in pain and can’t get relief, Dr. Rasmussen may be able to help you return to a normal, pain-free life. “Dr. Stephen Rasmussen, DC is setting the standard for non-surgical spinal decompression as the treatment of choice for those suffering with chronic, severe, disc-related back pain. The DRX9000™ has been the most important medical advance in the non-surgical, noninvasive treatment of back pain in the past 10 years. This FDA cleared spinal decompression technology is presently being utilized by neurologists, orthopedic surgeons, chiropractic physicians, family physicians, pain specialists, and physical therapists across the United States, Canada, Europe and Asia. Dr. Stephen Rasmussen, DC is proud to make this technology available in American Canyon. The DRX9000™ has quite frankly revolutionized our practice. 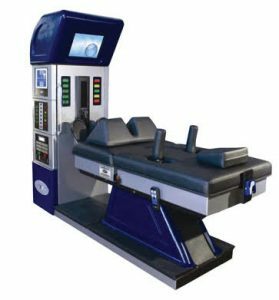 We now can help patients that, prior to the DRX9000™ spinal decompression system, would have had to live in pain for the rest of their lives or face the uncertain outcome of surgery. Patients come to us from all over. They come to us when other treatments have failed to give them relief.